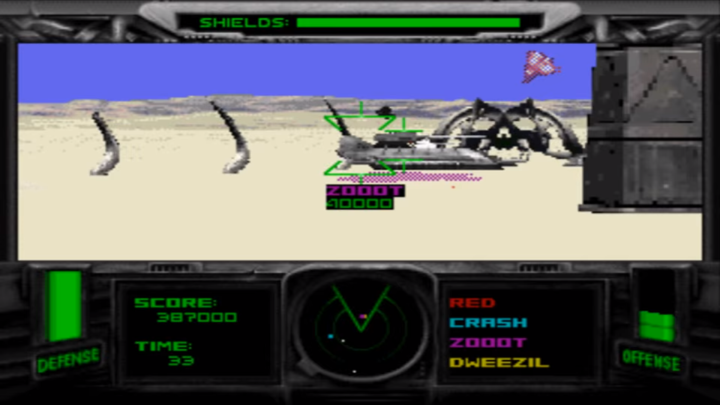 T-MEK is a first-person tank combat game that was initially released in the Arcades in 1994. Your job is to tear down Nazrac's evil empire by winning the T-MEK tournament which consists of a series of up to 18 battles. Each fight lasts between 30-360 seconds and usually the winner is the person who scores the most points by shooting opposing vehicles and blowing them up. There are also some matches where your objective is to simply destroy a particular boss tank to proceed. Six MEK tanks are available with individual stats (based on Weapon, Shield and Speed), and your offensive power and shield can be increased by collecting coloured icons scattered around the arena. 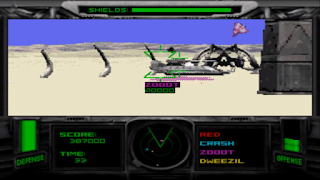 The gameplay is similar to Battlezone (1980, Arcades), but the stage design is uninteresting and the developers either randomly generated arenas, or just plonked random objects in a random order. Most of the time you can't even see what's ahead due to either the poor draw distance or the ill-advised night vision matches that result in a shambolic and chaotic mess. Aiming is an exercise in frustration too, due to the horrendously loose steering and the choppy frame-rate. Enemy A.I. is cheap and there's times (mainly in the later rounds) where they'll magically disappear from their current spot and end up behind you; this leaves you wide open to attack and it's especially aggravating when you lose the lead at the end of a match due to this unfair technique. After the first handful of matches you'll tire of doing the same old thing, and there's no variety to break up the action. There is a multiplayer head-to-head or battle mode, but the novelty quickly wears off when both players are affected by the shoddy programming! T-MEK could have been an entertaining tank combat game (particularly in multiplayer), but its monotonous gameplay and technical deficiencies dig a huge hole that it never manages to recover from. What's most inexcusable are the wonky controls, and in the end what you're left with is a stale, unimpressive and highly inaccurate shooter. Random trivia: In 1996, the game was ported to MS-DOS.